In 1888 Vincent Van Gogh painted a series of pictures of a lonely figure moving across a plowed field, a favorite subject of the artist: a broad gesture of the right hand indicates that sowing is taking place. However, the real protagonist of the paintings, which later became aptly known as “The Sower”, is the sun in the horizon, a huge, godlike, bright disk flooding the sky with light. The effect is so strong that colors are inverted and stark complementary colors appear: the sky is painted with yellow and the land with violet. Next year, while Van Gogh lived in an asylum for the mentally ill in Saint Remy, France, he painted similar pictures that later became known as “The Reaper”. It is not a rare instance to find celestial bodies in Van Gogh’s paintings, the sun, moon or stars, even turbulent galaxies. But the “Sowers” and the “Reapers” are exceptional: the viewer is left with the impression that the event of interest here is not the sowing or reaping that happens to take place on the foreground, but instead the cosmically important movement of the sun on the horizon. The presence of the human figure seems almost coincidental. In each painting (at least those not abstract enough so as to be completely disconnected from reality), two characteristic distances are relevant: the theoretical distance P of the painter from the subject and the distance V of the viewer from the painting. Once these two distances are in some way determined, the theoretical distance of the viewer from the subject is immediately implied. Though one may consider the distance V of the viewer from the painting as arbitrary, several features of a painting may indicate that this is not the case. Obviously, the size of the painting itself suggests to the viewer an acceptable range of distances at which he or she should be positioned. In some cases, a specific distance is imposed by special circumstances such as in Michelangelo Buonarotti’s “Cappella Sistina”: this magnificent masterpiece is painted on the ceiling, thus compelling the artist to adjust his work to a fixed distance from the viewer. In other cases, the painter himself, by the specific nature of his work, imposes a certain distance to the viewer. 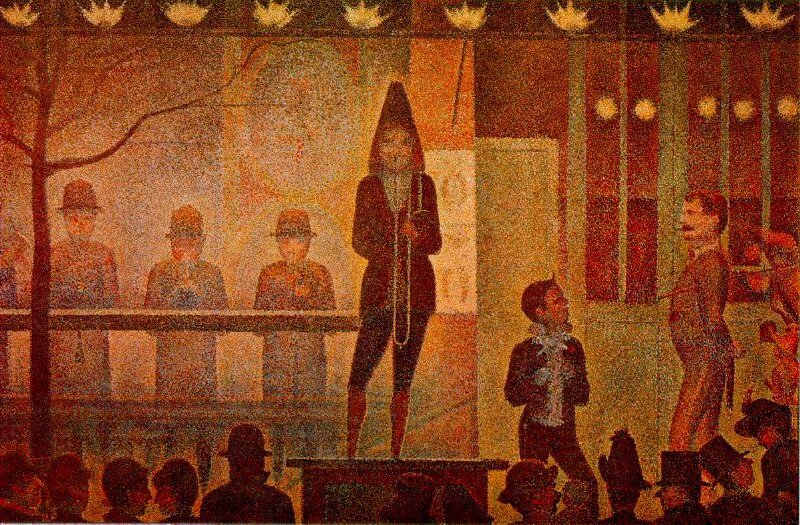 A good example is George Seurat’s “La Parade de Cirque”, where the image consists of a large number of small colored dots, only in primary colors. At close enough distance, the picture is unclear and obscure but at larger distances, the tiny dots appear to mix and compose a clear image, with a wide range of hues. Thus the mixing of the primary colors takes place in the eye and not in the palette. This is a technique similar to the modern printing techniques (mimicked by Roy Lichtenstein’s work). where r is the ratio s/d and h is the assumed real size of the object. Applying this simple approach to Van Gogh’s “Sower” of November 1888, we arrive to an amazing result: the artist observes the sower from a very large distance, approximately 350 m. What is actually depicted in the painting is a tiny detail of the landscape, not wider than 2,5 degrees, leaving to the viewer a very narrow “window” through which to observe the sower and the solar disk. where L is the real length of the painting (in this case 40 cm). The basic technique painters use to create a depth illusion is relied upon the perspective lines, i.e. straight lines that seem to converge to a point on the horizon. The relative sizes of the various depicted objects are adjusted accordingly, so as to promote this illusion. A realistically rendered scene is governed by the rules of linear perspective, i.e. the rules of properly constructing perspective lines. However, an important part in the creation of the depth illusion has the so called “atmospheric” perspective, based on the observation that objects at large distances acquire a bluish or “cooler” hue (this is why mountains in the distance seem to have a purple color). The reason is obvious: objects positioned very far away from the observer are actually viewed through a thick “lens” of air, altering the colors. In addition, the outline and the details of the object are blurred while at the same time its contrast is reduced. 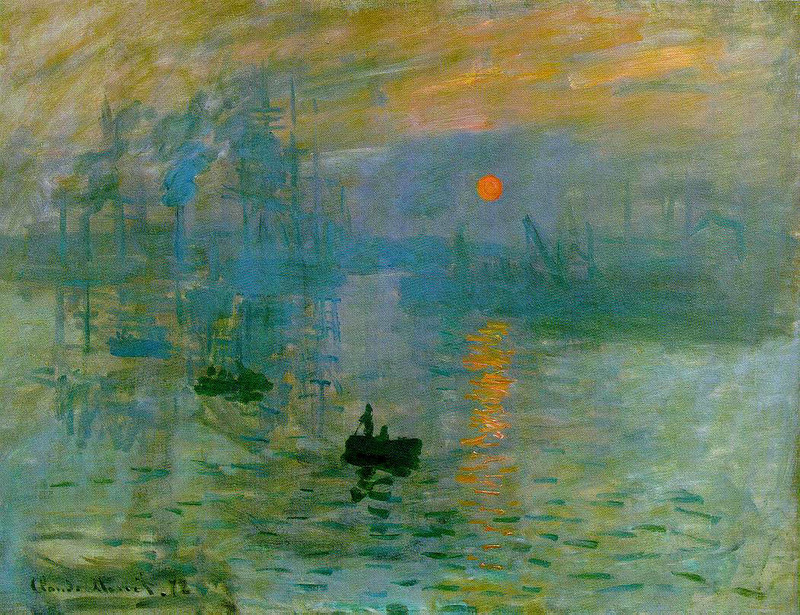 An example of this technique can be found in Claude Monet’s “Impression – Soleil levant” (1873) where the atmospheric perspective is the only visual clue to create the illusion of depth and distance. It is interesting, that both Monet in “Impression – Soleil levant” and Van Gogh in the “Sowers” and the “Reapers” have also used the solar disk as a visual clue to suggest depth and distance. It seems that the specific, great distance implied by the solar disk is exactly the reason for the absence of any detail in the human figure of the “sower” (November 1888). 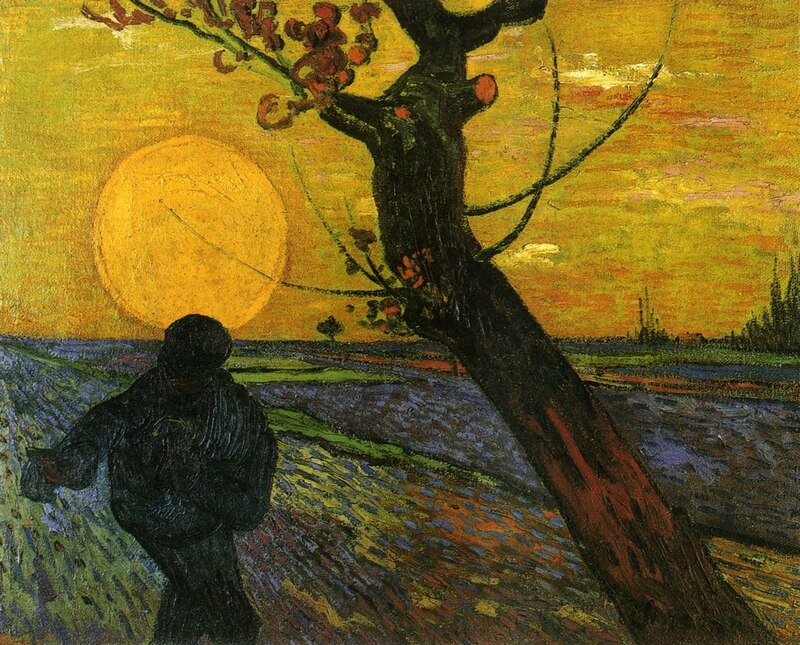 The mere size of the sun, as depicted on the painting, positions the painter 350 m away from the sower. The painting of a detailed and clear human figure in front of a huge solar disk would seem to Van Gogh an impossible, paradox image, simply because the size of the sun implies a distance not compatible with detailed representation. Similar conclusions can be derived for the other three paintings of the “Sower” and “Reaper” series. In the “Raising of Lazarus” (1890), another of the numerous Van Gogh’s paintings depicting a solar disk, the theoretical distance of the painter and the human figures can be estimated to be 35 m approximately. The detail of the human figures is much increased compared to the “Sowers” and “Reapers”, as expected for such a smaller distance. It is known that Van Gogh had been especially interested in perspective and had experimented with perspective frames. We can therefore reasonably assume that he had absolutely realized that the depiction of the solar disk creates a self evident distance between the painter and the subject. Contrast, colors, degree of detail are all qualitative features varying with distance and thus ought to be accordingly adjusted when the solar disk is present. 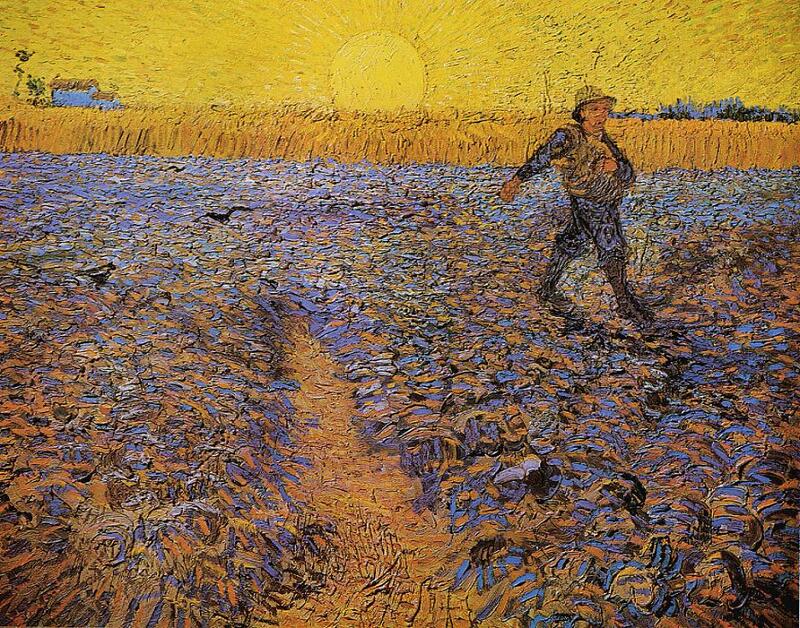 In the “Sowers” and the “Reapers”, and especially in the November 1888 version of the “Sower”, Van Gogh narrows his view to focus on a distant detail of the landscape and uses the sun as a primary clue of perspective. The bright disk on the sky becomes the means through which the painter positions himself against his subject and strengthens the depth illusion. This technique appears in tens of his paintings and reveals a remarkable intuition and ability to create distances simply by painting bright, colored disks in the sky.